* Main Components: Your main components are Products and Parts. You should set these up first. Our Implementation Team will guide you through this process. * Supporting Components: Includes Modifiers, Selection Lists, Variables, etc. You must assign these to main components. * Interface Components: Internal items such as Pricing Forms, Product Layouts, and Quick Products. * New Product Category: Creates a new product category, i.e. Jewelry. * New Product Sub Category: Creates a new product sub category, i.e. Silver or Gold. * New Product: Creates a new product, i.e. Earrings, Necklaces, or Bracelets. * New Top Level Product: Creates a new product that is not inside of a category, i.e. Hats. * Delete: Removes an item from the database. * Close: Closes an unedited screen. 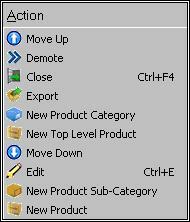 * Export: Exports the displayed information for use in another program. * New Product Category: Creates a new product category. * New Top Level Product: Creates a new top-level product. * Edit: Enters a mode that allows previously saved information to be changed. * New Product Sub Category: Creates a new product sub category. * New Product: Creates a new product. * Is Scheduled: When this option is selected, additional fields for Duration and Alt. Percent Complete Fx appear. If this option is not selected, these fields do not appear. 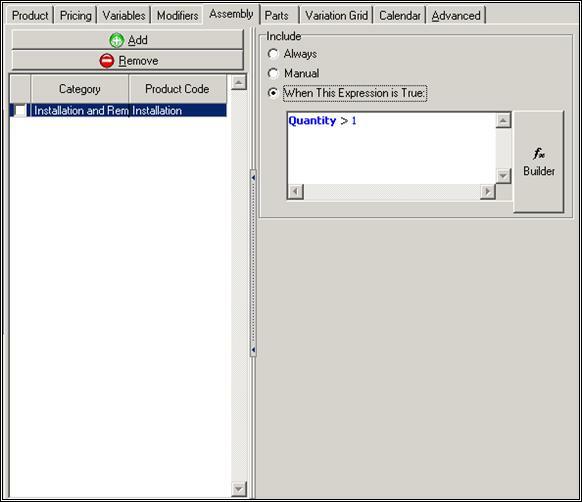 * Is An Assembly Container: When this option is selected, it can contain assemblies (you can find more information about this in the Control 4.0 Changes Manual). If this option is not selected, it will not contain assemblies. * Product Code: Enter the name of the product. You will use this name to search for the product throughout the program. The Product Code must be unique among products. To rename the Product Code after you have saved the product, click on the Rename button. 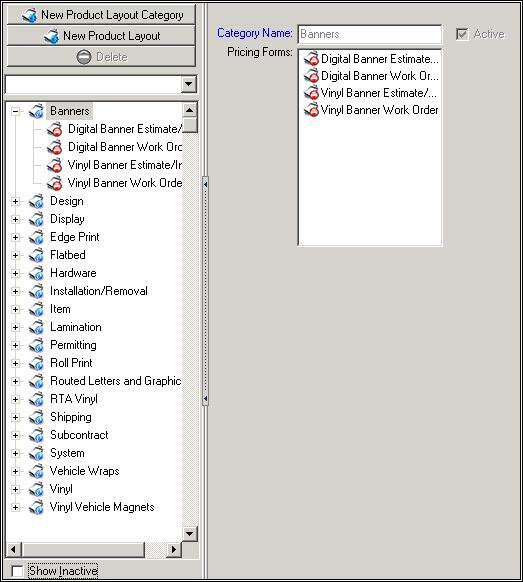 Product codes appear on pricing forms and on product layouts. If you rename a product code, you must manually change all references to the product in all pricing forms and products where that product code appears. Category: Select the category for the product. * Text on Estimates: Enter a name for the product that you would like to show up on estimates. Often the product code is not adequately descriptive for use on estimates. Here you may include a description of up to memo size. By default, this text will be the same as the product code itself. * Bar Code: Enter or scan the numeric barcode to use for a product into this field. 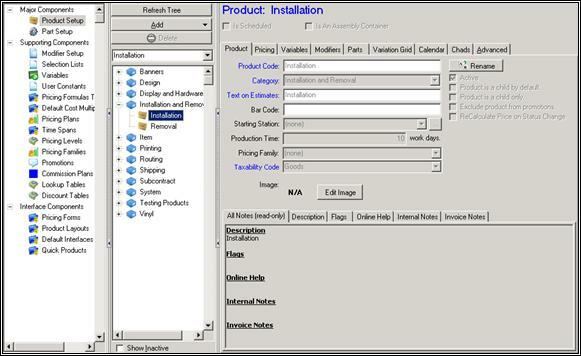 Control will encode it as a product, so you may duplicate bar code numbers between products and parts. With the purchase of an external font package, Cyrious Control can print bar codes on invoices, work orders, and other customized reports. * Starting Station: If you are using stations to track the progress of a line item through production, you may want this product to start in a particular station. Enter the desired station here. * Production Time: Record the default amount of time (in days) it will take to produce this product. * Pricing Family: If there is a pricing family associated with this product, enter it here. * Taxability Code: Enter the taxability code for the product here. * Image: Provide an image for the product that will also appear in Quick Products. This image can also be printed on the invoice and work order. * Active. When no longer offering a product, do not delete that product from the system. You should mark it inactive by de-selecting this box. * Product is a child by default. Control displays a product listed underneath another product, as though it is an element of the product. Child products' pricing is normally attributed to the parent product. If this box is checked, the product will become the child of the product above it, unless there are no products in the order before the product is added. * Product is a child only. If this box is checked, any time you add this product to an order, it will always be the child of the product above it. * Exclude product from promotions. If this box is checked, percentage-based promotions will not apply to this product. For example, if you have a 10%-off campaign excluding your shipping products, checking this box for shipping products will prohibit applying the discount to them. * Recalculate Price on Status Change. By default, changing the status of an order does not recalculate the pricing. If you want the pricing of a product to change automatically, checking this box tells Control to recalculate the pricing when the status of an order changes. Taxes: Select the appropriate tax option for this product based on local regulations. When one item in an order is marked tax exempt, all items in that order follow suit. Additionally, if a customer is listed as tax exempt, subsequent orders for that customer will default to that tax setting. * Sales Account: Identify the general ledger income account to associate with this product. * GL Department - Enter the GL Department to associate with this product. * PreDiscount Price: Enter the value or formula for the pre-discount price. To select a saved formula from the formula templates box, click inside the PreDiscount Price box and double-click on the desired template. Built In Discount: Enter the value or formula for the built-in discount. This discount typically applies to high-volume discounts. Any value given to the built-in discount will not appear as a line item. To include a visible discount, use the Default Discount function instead. * Default Discount: Enter the value or formula for the displayed discount. This will appear on the invoice and estimate, usually referred to as “Discount”. * Product Warnings: Enter a formula to test for any potentially problematic situations. Provides a warning message to the User when the line item pricing form is closed. The User may still save the product with warnings. When there are no warnings, an empty string is returned. * Product Errors: Enter a formula to test for any potentially problematic situations. Provides a warning message to the User when the line item pricing form is closed. The User cannot save the product while any errors are returned. When there are no warnings, an empty string is returned. * Notes: Add any notes about this formula. * Formula Templates: Create and select a saved formula by using the Formula Template box. If this box is not visible, click and drag on the size bar to reveal it. To create your own saved formula, select the Add button at the bottom of the box. Inside the New Pricing Formula screen, you may either write your own formula or select the formula builder button to create your own formula. * Base Min: To set a minimum base price (pre-discount price – built-in discount price), enter a value or formula in this field. If the base price is less than this amount, regardless of quantity, then the base minimum is used instead. * Subtotal Min: The subtotal will never be less than the amount specified in this field, regardless of quantity . 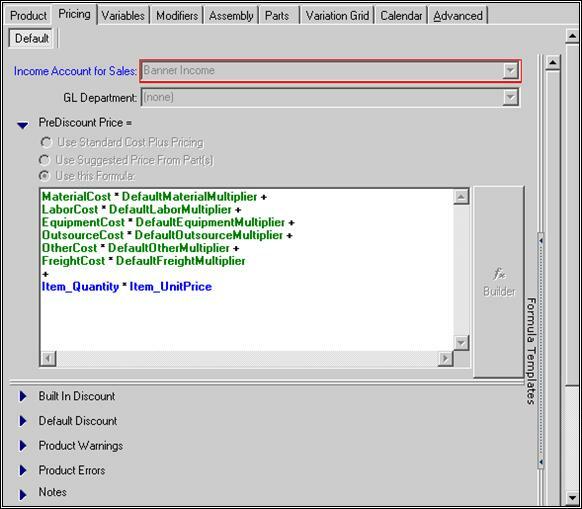 * Per Piece Min: To set a minimum base price per piece, enter a value or formula in this field. The unit price of your product will not fall below the value entered. * Rounding: Select how the product subtotal is rounded for a given product. Taxes occur after the rounding and result in a non-rounded number even when rounding is enabled for a product. * Variable: You may want to consider the unit price of a product based on a variable different from quantity. For instance, if you were selling shoes, you might want to choose to consider the unit price based on pairs rather than the quantity of shoes. * Units: ………..each. You may select any of the numeric variables assigned to the product as the unit variable. Control will automatically adjust the unit price calculations that display on invoices, estimates, work orders, order entry screens, etc. 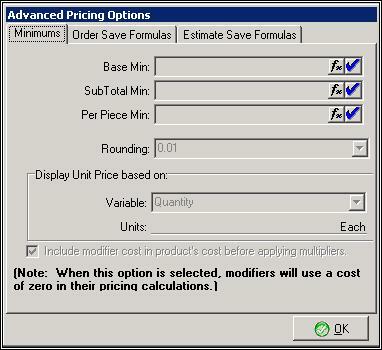 * Include modifier cost in product's cost before applying multipliers. If this box is checked, the costs for all modifiers are combined into the product's cost before any cost-plus calculations are performed. If this box is unchecked, the price and cost for each modifier are calculated individually. Note: When this option is selected, modifiers will use a cost of zero in their pricing calculations. 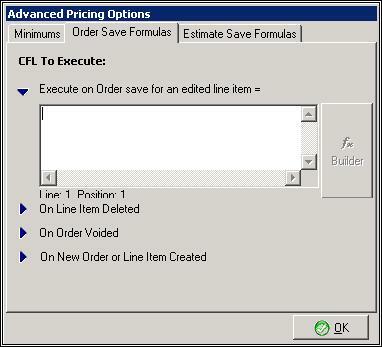 * On Order Edit - Enter a formula to be executed when an Order is saved after editing a line item. * On Line Item Deleted - Enter a formula to be executed when a line item is deleted from an Order. * On Order Voided - Enter a formula to be executed when an Order is voided. * On New Order or Line Item Created - Enter a formula to be executed when a new order is saved or a new line item is added to an existing Order. 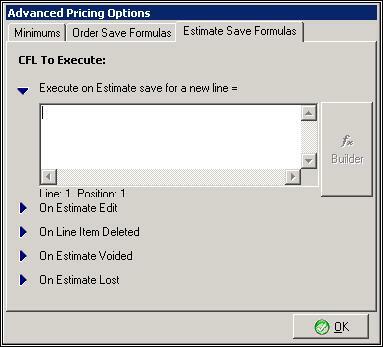 * On New Estimate or Line Item Created - Enter a formula to be executed when a new Estimate is saved or a new line item is added to an existing Estimate. * On Estimate Edit - Enter a formula to be executed when an Estimate is edited. * On Line Item Deleted - Enter a formula to be executed when a line item is deleted from an Estimate. * On Estimate Voided - Enter a formula to be executed when an Estimate is Voided. * On Estimate Lost - Enter a formula to be executed when an Estimate is marked Lost. 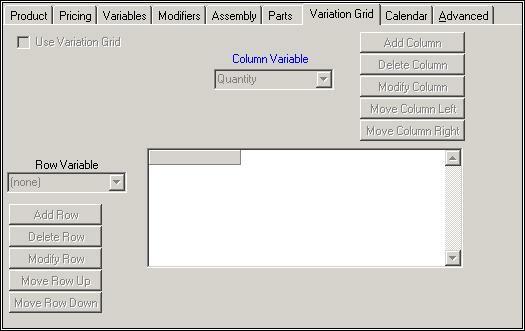 * Show Only Variables in Use: Select this box to view only product-assigned variables. When configuring variables, it is easier to view only assigned variables. If you need to associate additional variables with the product, leave this box unchecked to view all variables. * Override/Restore button: This button changes depending on what kind of action you have just completed. Click on the button when it is labeled Override to enable changes to the configuration that are specific to a product and pricing plan. By default, a variable that has been associated with a product uses all of the default values established in the variable setup. If you want to return to the default (global) values, click on the button when it is labeled Restore. 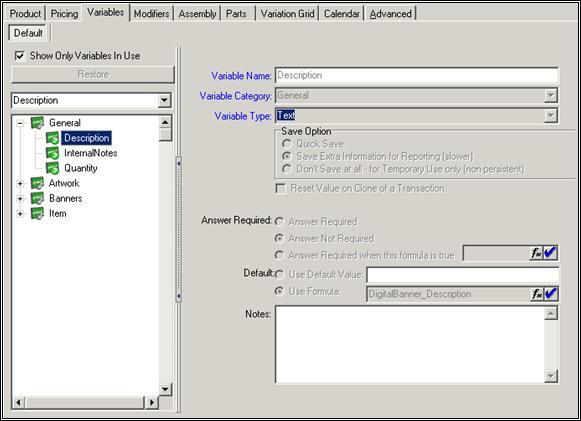 * Always Save Transaction Detail Record: Cannot be changed at the product level. If this box is checked, Control will save an extra record in the database when this product is used in a line item. This extra record makes reporting easier, but saving it will slow the saving process and use additional space in the database. Do not select this option unless it is required for specific reporting. * Variable Applies to Modifiers Only: Cannot be changed at the product level. * Units for Entering Values: Applies to numeric and table variable types. Enter the unit to be used by Users entering a value for this variable in a pricing form, for example, if you selected “pair” here, every time a User entered a value of one, you would not be selling one shoe, but one pair of shoes. If you selected “roll” here, every time a User entered a value of one, you would not be charging for developing and printing one picture, but you would be charging for developing and printing one roll of film. * Units for Displaying Values: Applies to numeric and table variable types. Enter the unit to be used when displaying this variable on the pricing form or in a product layout. * Default Value: Applies to numeric, list, and table variable types. Enter a default value for this variable. This value is assigned when the product is initially added to an order and may be overridden by the User. * Default Formula: Applies to numeric, yes/no, list and table variable types. Enter the default formula to use for this variable. Unless it is overridden, Control recalculates the variable's value each time another variable in the product changes. * Answer Required: Applies to all variable types except yes/no. If this box is checked, a User entering an order or estimate will not be allowed to save it until a value is given for this variable. You may set up a default value or formula that will satisfy this requirement. * Valid Range: Applies to numeric variable types. Enter a minimum and maximum value that this variable may have. Set both values to zero (0) if you want Control to ignore the range. If a higher value is entered or calculated, it is automatically adjusted to the maximum value. Likewise, if a lower value is entered or calculated, it is automatically adjusted to the minimum value. No warning message is generated when the adjustments occur. * Default List: Applies to list variable types. Select the list of values to use for this variable. This list may be overridden if there is a value in the Use Secondary List From field. * Limit to List: Applies to list variable types. Check this box to prevent the User from entering any value that is not in the selection list. If this box is unchecked, the User may type in custom values for this variable. * Use Secondary List From: Applies to list variable types. Enter the variable that contains the primary list that this variable depends on. When a value is entered in the primary list variable, Control will check to see if a different secondary list applies to this list variable. * Default Part Consumption Fx: Applies to list variable types. Enter a default consumption formula to use for the part that is linked in the selection list for this variable. * Default Part Description: Applies to list variable types. Enter a part usage description for the part that is linked in the selection list for this variable. * Default Second Part Consumption Fx: Applies to list variable types. Enter a default consumption formula to use for the second part that is linked in the selection list for this variable. * Default Second Part Description: Applies to list variable types. Enter a part usage description for the second part that is linked in the selection list for this variable. * Default Pricing Table: Applies to table variable types. Select the pricing table to use for this variable. To create a new pricing table, select New from the drop-down list. * Setup Table Button: Applies to table variable types. * Modifier Grid: This grid displays all of the modifiers currently associated with a product. To add a modifier, click on the Add button and select the modifier(s) to add. To remove a modifier, check the box in the first column and click the Remove button. You may not change any of the values directly in the grid, but selecting an item in the grid will display its information in the right-side panel. 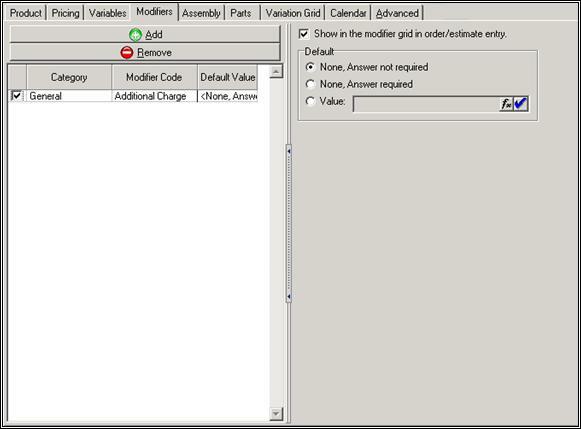 *  Show in the modifier grid in order/estimate entry: Check this box to show a modifier during order entry. The modifier will appear in the list of All Modifiers displayed in the modifier grid. If this box is not checked, the modifier will not be displayed in this list. * Use Modifier List: Applies to list-based modifiers. 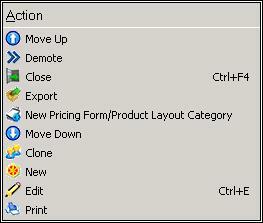 Check this option to use the default selection list entered in the modifier setup. This is the default setting. * Use Alternate List: Applies to list-based modifiers. Check this option to select an alternate selection list used with this modifier for this product. 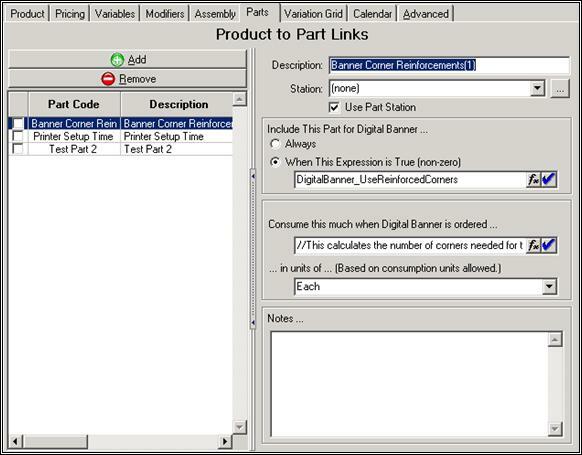 * Default Part Consumption Fx: Enter a default consumption formula to use for a part that is linked in the selection list for this modifier. * Default Second Part Consumption Fx: Enter a default consumption formula to use for the second part that is linked in the selection list for this modifier. * Use secondary list from: (if possible): Applies to list-based modifiers. Select this box to apply a secondary list to a modifier. A list-based modifier may use a list-based variable to determine the selection list to use. When a value is entered in the primary list variable, Control will check to see if a different secondary list applies to this list variable. * Default None, Answer not required: Select this option to specify no answer is required to save this order. No default will appear. * Default None, Answer required: Select this option to specify that an answer be required to save this order. No default will appear. * Default Value: Select this option to specify a default value for this modifier. For yes/no and list modifiers, select the default value from the list provided. For other modifier types, enter the default value in the edit box provided. * Description: Type in a description of the part. * Include This Part for [Product] Sale…: This is where you link the part to a product. You can choose to include this part in every instance of a product's sale, or only when certain expressions are true. * Consume this much when [Product] is ordered…: Specify how much of the part is used up each time it is included with a product. * … in units of … (Based on consumption units allowed): Declare the unit of the part. * Notes: List any notes in this section, perhaps explaining reasoning as to why the part is included with some instances of a product but not others. 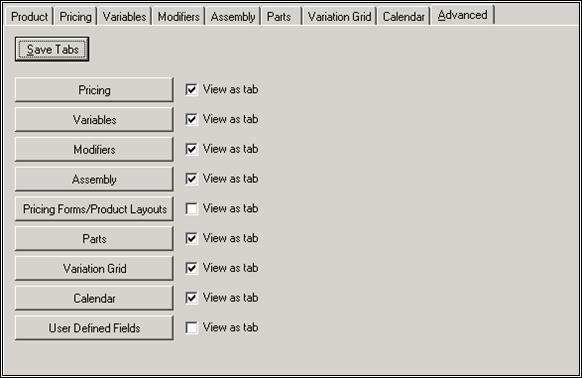 * The Variation Grid tab allows you to customize the columns that will show up on the various grids shown throughout Control.  Schedule Work Assignment for this product - When this option is selected, the remaining fields (explained below) will be accessible. If this option is not selected, you will not be able to access the remaining fields. * Required for orders: Check this box to make scheduling a work assignment mandatory when entering an order containing this product. If this box is not checked, the use of work assignments for this product will be optional for orders. * Required for service tickets: Check this box to make it mandatory to schedule a work assignment when entering a service ticket for this product. * Schedule for estimates using this product: Check this box to allow work assignments to be scheduled for estimates. If this box is not checked, work assignments are only allowed for orders and service tickets. * Required for estimates: This box is enabled when Schedule for estimates using this product is checked. Check this box to make scheduling a work assignment mandatory when entering an estimate using this product. * Default to [ ] days from order/estimate date: To schedule a work assignment a few days ahead of the order or estimate, enter the default number of days into the edit box that the work assignment should be scheduled. * Use a work assignment template: The information entered in this template will appear as a default in the actual work assignment when it is created during order or estimate entry. The fields below are what appear in the work assignment template. * Reminder: Select what type of reminder you would like to set up for the activity being created. * Priority: Designate a priority level for the item. * Location: Specify a place for this activity. * Order: The order number that correlates to the new activity. * Estimate: The estimate number that correlates to the new activity. * Family: The family for the company with which this order/estimate corresponds. * Contact: Customer contact name. * In this tab, check off the boxes that correspond to which tabs you want to view when you are setting up your pricing. Changes will take effect the next time you open Pricing Setup. * Move Up: Moves the selected item in the list up. * Demote: Demotes the selected item in the list. * New Pricing Form/Product Layout Category: Creates a new category for your pricing form or product layout. * Move Down: Moves the selected item in the list down. * Clone: Clones the selected item in the list. 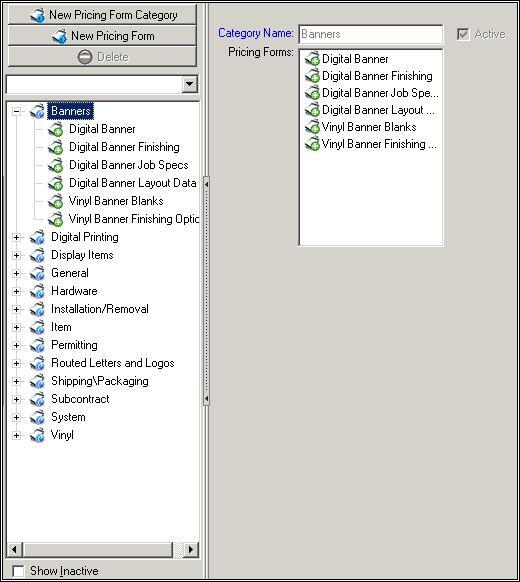 * Print: Creates a new pricing form or product layout. * New Pricing Form Category: Creates a new pricing form category. * New Pricing Form: Creates a new pricing form. * Delete: Removes a pricing form from the database. * Category Name: Enter a name for the category. * Active: If this box is checked, the pricing form is active. * Pricing Forms: Lists available pricing forms within the category selected. *  Show Inactive: When this option is selected, all options will be shown in the list. If this option is not selected, only active options will be shown. New Product Layout Category: Creates a new product layout category. New Product Layout: Creates a new product layout. Delete: Removes a product layout from the database. Category Name: Enter a name for the category. Active: If this box is checked, the product layout is active. Pricing Forms: Lists available pricing forms within the category selected.  Show Inactive: When this option is selected, all options will be shown in the list. If this option is not selected, only active options will be shown.